In his party conference speech, David Cameron did mention inequality. He did not say, as Ed Miliband said recently (see postscript to this post): “This country is too unequal. And we need to change it.” Instead he said “Under Labour, inequality widened. With us, it’s narrowed.” So do the two quotes above mean that both major parties now aim to reduce inequality? Here is the evolution of two aggregate measures of UK income inequality over time, as calculated by the IFS from this recent study. If the decline in real wages since the financial crisis has reduced overall inequality, what impact has government fiscal changes had? In a landmark report issued this week, Paola De Agostini, John Hills and Holly Sutherland analyse who has gained and who has lost as a result of the direct tax and transfer changes made by the coalition government. (Indirect taxes are excluded.) One of the things I liked about the analysis is that it attempted (with some success) to reconcile its own results with similar analysis undertaken by the UK Treasury and the IFS. The headline result is shown in this chart. There are many other interesting results from the study, but let me mention just three here. The first is contained in the most right hand black dot. Over the period in which the coalition has been in power, changes in direct taxes and benefits have had no significant overall impact on incomes, compared to what would have happened if indexation had run its normal course. That means that the impact of benefit cuts in reducing the deficit has been almost exactly offset by tax cuts. The second told me something I should have realised about the Treasury’s analysis of the distributional impact of budget measures. The Treasury’s analysis is similar, but with one important difference - the biggest losers in their figures are the top income decile. As the report shows, the main reason for this is straightforward - the Treasury analysis starts from January 2010, not (as in this report) from May 2010. Why does this make so much difference? Because the new higher 50p tax rate introduced by Labour actually started in April 2010. George Osborne subsequently reduced this to 45p. 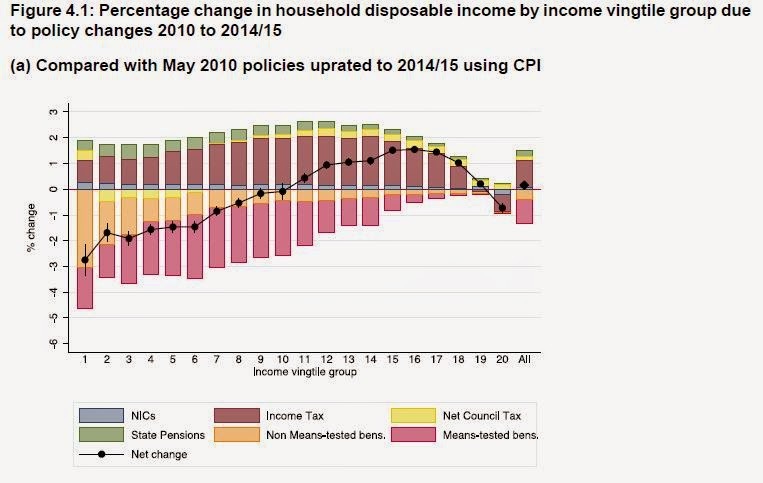 So the Treasury’s figures show the top decile losing as a result of the top tax rate going from 40p to 45p, while this study starts at the 50p the coalition inherited. The third bit of the analysis I wanted to mention was how these numbers might change by 2019/20 under current plans. The broad picture remains similar, but with one large question mark for the lowest decile, concerning the introduction of the new Universal Credit (UC). One of the hopes for UC is that it will increase the uptake of benefits. The report calculates that if everyone who currently claims any one of the benefits UC replaces takes up UC, then UC will lead to large (+3%) overall gains for the bottom decile. Whether this will happen depends in part on the efficiency and manner in which it is introduced. There is perhaps a more interesting dimension to «trickle down effect will make sure those in the lower half/bottom» and it is the "divisive" issue that our blogger hopefully for brevity does not address, and it is the very different situation for the tory so-called Middle England and the North and celtic fringe areas. The graph above has a huge jump just around the time the government policy was to smash the industrial economy of the North etc. to smash the trade unions (which I agree had become a big problem). The North etc. have not recovered from that, and those areas have been in depression for 35 years, with their middle classing nearly erased and their working classes pauperized. Perhaps the very different trajectories of the economies of North etc. vs. so-called "Middle England" vs. London account for a large chunk of the jump in the aggregate Gini, especially as the government has recently handed out enormous sums of welfare to protect the salaries and jobs of bankers and other spivs in the "Middle England" and London areas that largely vote tory and provide very well paid low-effort directorships to retiring Tory politicians. It makes ugly reading when it was the shadow banking sector that set off the crisis in 2008. And even if you were to blame the Labour government and the opposition parties for never regulating (not unregulating) these banks, the conclusion that you hit the lowest half of 20 income groupings, getting steeper as the people get poorer, says a lot about the UK. Surely you're not suggesting that the 'wealth creators' - those who (unlike the bottom half of the income distribution) can afford to shoulder the bulk of the burden of the financial mess that they themselves caused - should actually take financial responsibility?? Privatise the gains/profits, socialise the losses old boy! Look at Figure 3.3 and you see what sort of country the UK is and what mainstream economics since 1978 has achieved. You can indeed. Inequality has hardly budged for 25 years and has fallen in recent years as wages have fallen. So, the lesson is that if we want inequality to decline, pray for a nice long recession. (Anonymous 18 November 2014 12:55) - This is change not really down to mainstream economics, although some economic ideas were used as cover for some very nasty political ones. SH - It depends on what measure of inequality you use, for the Gini coefficient this is true although there are some issues with this measure. The income of people at the very top (say the top 0.1% or even top 0.01%) has most definitely grown for most of the last 25 years. "Because the new higher 50p tax rate introduced by Labour actually started in April 2010. George Osborne subsequently reduced this to 45p. So the Treasury’s figures show the top decile losing as a result of the top tax rate going from 40p to 45p, while this study starts at the 50p the coalition inherited." Often said, but worth pointing out again, that we had 13 years of Labour with a top rate of 40p, only for them to put it up to 50p for the last month in office. If the Tories left a similar poison pill, one, can imagine S W-L's (impartial) fury. I have no views on S W-L's fur. That's a very cynical view of things, a little too cynical I think. For most of those 13 years Blair was in charge and he was centrist to the very core of his being so just wouldn't have accepted it. Brown was more open, but for much of his premiership fiscal stimulus was a much higher priority.
" Blair was in charge and he was centrist to the very core"
Blair was just a brilliant politician. He understood the government machinery, the media and the electorate and how to get things through. His policies were merely the orthodoxy at the time. They were to maintain a light touch approach to financial (and labour and goods) markets, backed up by a lot of faith in the central bank, economic geniuses, algebra, econometrics and wizardry to keep a steady and dexterous hand over the levers. Any questions and it would be answered with "sophisticated" algebra and the rational expectations hypothesis. Had you given Blair a different set of policies to sell - the direct tackling of inequality, closer supervision of the financial sector and the separation of retail and wholesale banking, an eye on the housing sector and signs of liquidity gluts and direct policies that aimed at the long term native unemployed - and all this was the orthodoxy of the time - he would have got those things through as well. He also fully believed in the policies that he was selling to the electorate. He makes it quite clear in his biography that his belief in those policies was genuine and not some show for the electorate. You can both be right. Blair sincerely believed that the politics of "Blow you! I am all right Jack" were the right politics for winning over so-called Middle England. They also enabled a Labour government to introduce some social-democratic policies in an understated way to avoid the wrath of the same so-called Middle England. «I can vividly recall the exact moment that I knew the last election was lost. I was canvassing in the Midlands on an ordinary suburban estate. I met a man polishing his Ford Sierra, self-employed electrician, Dad always voted Labour. He used to vote Labour, he said, but he bought his own home, he had set up his own business, he was doing quite nicely, so he said I’ve become a Tory. He was not rich but he was doing better than he did, and as far as he was concerned, being better off meant being Tory too. After meeting "Sierra man" Blair realized that the winning thing to do was to pander to "Blow you! I am all right Jack" voters as much (or perhaps as little) as possible. I am sure he believed sincerely in that. I hope readers of comments can tolerate more of my usual quotes on the "Blow you! 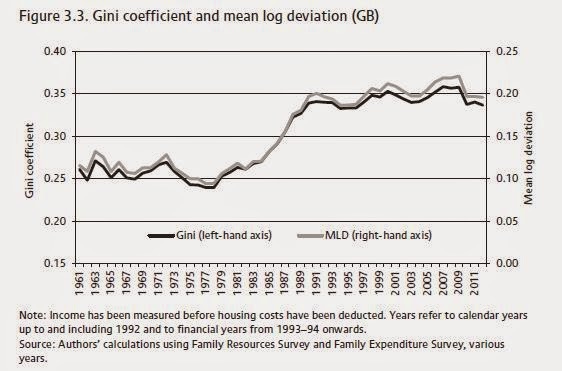 I am all right Jack" politics that have resulted in the Gini/MLD chart above. There is a growing concern in the Government that the Prime Minister is alienating the aspirational middle classes who put Labour into power in 1997 and have kept it there ever since. ... Although Mr Brown talks a lot about aspiration, he means it in the sense that people at the bottom of the pile should be able to get to the middle, rather than that those in the middle should aspire to get a little bit further towards the top. His preoccupations with child poverty, Africa and banning plastic bags are all very worthy – but they leave the conservatory-building classes thinking: what about us? What seems amazing to me is that in the same period that "real" GDP rose by 37% non-housing wealth mostly decreased in "real" terms. Such are the consequences of "Blow you! I am allright Jack" politics. What is also amazing is that *average* UK "real" house "wealth" has tripled even if 1/3 to 1/2 of the country (North and celtic fringes, the areas that don't vote Tory) is still in a deep depression that has begun around 1980, and where house prices have been falling or not growing at all (except for a brief period of contagion during the weirdest parts of the debt-collateral spiral). What makes a plot of land (or identical house) in London more valuable than up north? It is location value, better schools, infrastructure provided by UK taxpayers. A land value tax would discourage land hoarding - people will either have to use land or sell onto someone who will and it has no deadweight loss as the land supply is fixed. The only people to lose out are massive landlords or not even that, people who passively hold land weighting as it increases in value! If you take into account the VAT raise and other indirect taxes it is likely to be even worse. Do we get the leaders our media deserves? Can we have our instrument back?